Real metal thread work is a centuries-old style of embroidery. Kreinik real-metal Passing Thread #5 is one of the tools you can use to create your own real metal thread embroidery today. It is a smooth, round, firm but flexible fiber available in gold and silver (thin metal wrapped around a core). This thread is used for surface couching and outlining. Lay Passing Thread on the surface of your fabric or canvas and couch (or tack down) with a thinner thread like Silk Bella, Silk Couching Thread, or Japan #1, either matching or in a contrasting color depending on the desired look. 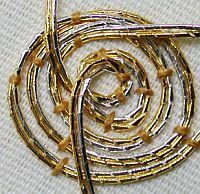 Beautiful designs can be created by laying two or more strands parallel, as in the technique Or Nue. It offers a solid, smooth gold look. Simply trim the ends, or pull to the back of your work and secure with your couching thread. Keep a pair of serrated-edge embroidery scissors to use with your real metal threads and you will always get the cleanest, sharpest cut. Kreinik Passing Thread is ecclesiastical grade of real metal. This grade will remain bright for approximately 10-20 years. The passing thread has 2.5% GOLD along with a lacquer which prevents oxidation for a long period of time.